I made the cutest bag yesterday. I was out in my garage snooping around the other day and found all of this. I have boxes and boxes of "keepsakes". I was wondering what happened to this old coloring book. It was in a box with the cutest fabric. My best friend made pillows for me out of this paper doll fabric a few years ago and gave me the leftover fabric. 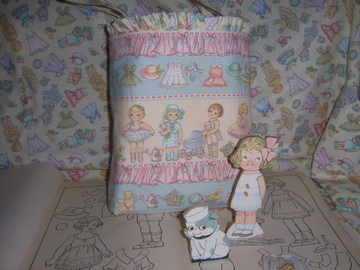 In the same box were some "paper dolls" that I bought over ten years ago. They aren't actually "paper" dolls because they are made out of thin wood. They can stand alone. I have another one that is a really cute Kewpie with lots of outfits too. I was going to collect them but I have never shopped where I saw more of them. They need to be out of the box though. I just don't know where to put them. Speaking of collections, I'm off to an estate sale. I'm a little late starting out. Hopefully I haven't missed out on all the treasure. I've found a new obsession. I should be sewing, maybe even cleaning, taking a shower. I should be getting out of this chair and doing something besides sitting here drooling over the keyboard. But, I'm so hooked. I just found the New York Public Library's Digital Gallery. Did you know there are thousands of images you can download for FREE? Oh my goodness! 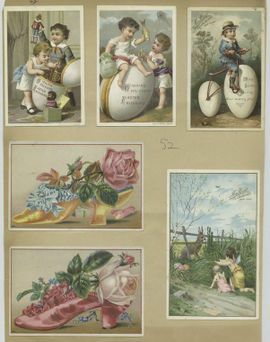 I found sheet music, greeting cards, postcards, old advertisements....What will I do with all these images? I'm not sure. Scrap booking, altered art, blog illustrations. The ideas are just flowing through my brain and now I have something new to be obsessed with. Go see for yourself. Fun. Fun. Fun. and be your powder puff." ..... 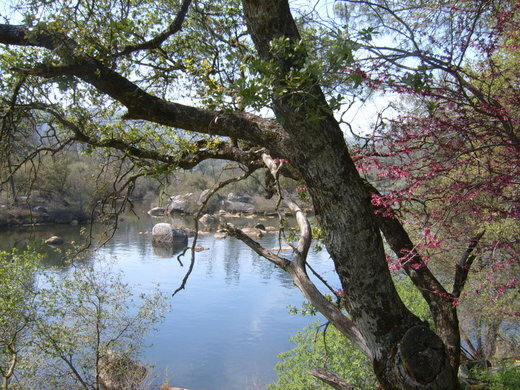 It is a beautiful spring day here. We had some crazy weather a few nights ago. We just cleaned the yard, washed the patio, raked and pulled weeds. Then the mother of all wind and rain storms hit and the yard is a mess again. I planted bulbs and flower seeds the afternoon before the storm and I am hoping they will still sprout. Maybe they blew a mile away and I will be seeing random patches of Shasta daisies everywhere. Today I am going to lunch with two of my favorite people. My two oldest children. It is so nice when your children grow up and they have turned out to be your friends. Not only are they my friends, but they are and have always been good friends to each other. 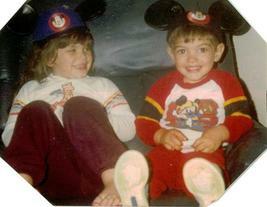 There were days when they would argue and they laugh now at the punishment I inflicted on them. I would make them stand toe to toe until they apologized. They usually ended up laughing and forgetting why they were mad. I've always told them that friends will come and go but your siblings are forever. I know that my four brothers and I have had our arguments but when times are tough, we all pull together. If you haven't visited my friend Amy at Four Sisters in a Cottage, you really need to go see her website. All the loveliness above is from Amy's web store. She sells the cutest vintage goodies. What drew me to Amy was not just the items in her store but the pretty vignettes she photographs of her inventory. She has the cutest studio with pink and white striped walls. I would love to transplant the whole place into my home. 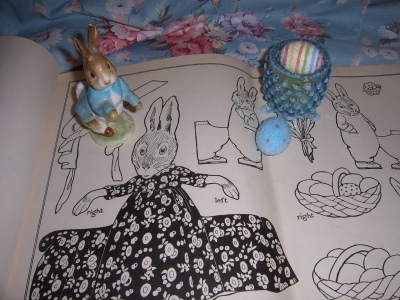 It transports me back to a time when I was "playing house" with my dolls and trinkets. It's all about karma. Today's estate sale. Same Great Estates estate liquidators. Different neighborhood. Same cashier as the last estate sale with the chintz bowl. Enter me. I spy a sewing bag or laundry bag in all the right colors. No price tag this time. My day for a great deal. $3.00. Happy me. I figure it all balances out in the end. 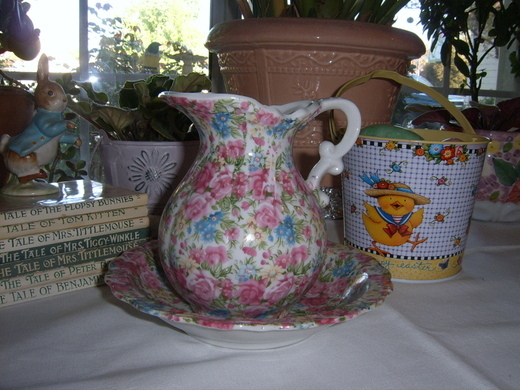 This little chintz pitcher and bowl is so pretty. I just love it. When I go to estate sales I try not to spend more than $5.00 for anything unless it is a piece of furniture or an old crock. This was marked $6.50. I couldn't resist. When I got to the cashier though, she insisted that it said $16.50. At almost every sale I go to there is always someone who is dickering loudly and sometimes obnoxiously with the cashier. That always embarrasses me. I didn't want to be that person. And I do love chintz porcelain. So I took a deep breath and I paid for it. I wanted to argue even though it is really beautiful. 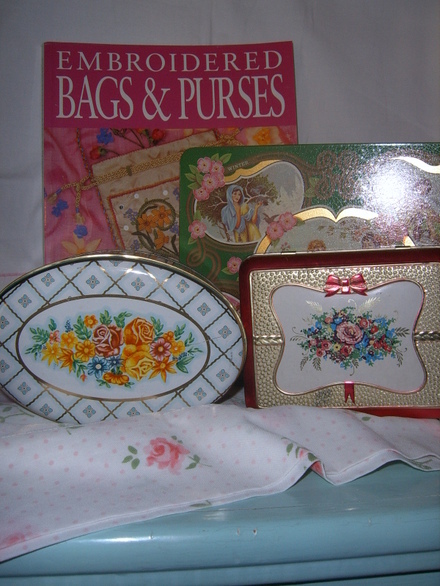 I know chintz porcelain is a hot seller right now. It isn't marked though and there are no tell tale signs to say that it is old. So what do you think, friends, did I spend too much? The new issue of Martha Stewart is out and she says that it is time to spring clean. 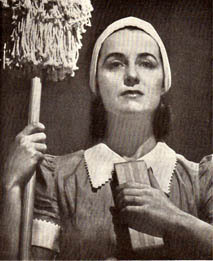 So I'm off to drag out the dust rags, mops and buckets. The house will be all sparkly and shining for about two minutes. Where does all that dust come from? I'd much rather be sewing or better yet, shopping. I love roses. I would love to have a cottage surrounded by big pink cabbage rose bushes. I was lucky today. I stopped at my favorite thrift store and found a big pillow covered with roses selling for $3.95. The pillow is even stuffed with 90% goose down feathers. I knew it was Ralph Lauren right away because I had already bought a sheet in the same fabric from a seller on Ebay. 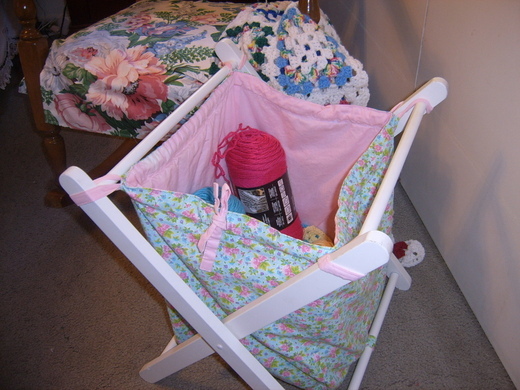 I used the sheet to make a curtain and a slipcover for a storage bench in my bedroom. Now the rose pillow sits on my bed in front of my pillows that are wearing Ralph Lauren pillowcases. I bought them for a $1.00 at the same thrift store months ago. I also found two white chenille pillow shams today. They have been at the thrift store for some time and were 75% off of $7.95. I washed them and they came out looking brand new. Good day at the thrift store. 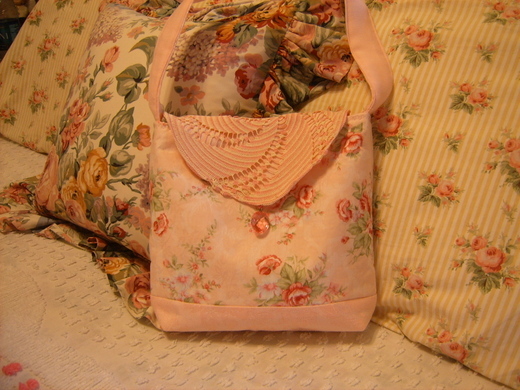 I've been sewing pink roses too. I had an order for a pink purse. It turned out sew cute so I made another one to sell on Ebay. The flap is a vintage doilie with an old pink crystal dangling from it. They are lined with pink linen cut from a vintage pink tablecloth bought from, where else, my favorite thrift store.